Off Road is a new must use bull for ’09 and today’s answer for a Fresh Outcross Pedigree. 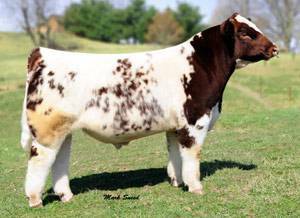 His sire is a popular Canadian- bred bull and his dam produced the Grand Champion Female at the 05’ and 06’ Illinois State Fair. Off Road is perfect in his hip and ground structure and combines muscle, body, performance and eye appeal in an exciting package.